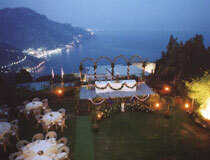 Hilltops and sea views combine to the most idyllic wedding venue locations. 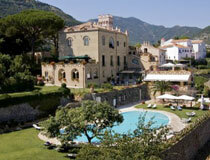 Boasting a tranquil setting high on the cliffs above Amalfi, Ravello is about 1hr 30minutes’ drive from Naples airport. Reputed to be one of the most attractive spots along the Amalfi Coast, Ravello offers the most wonderful views from its unique location, 365m above sea level. 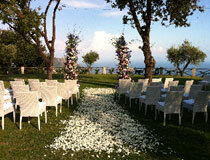 Villa Eva , one of our special wedding venues in Ravello, truly complements the beauty of the area. This splendid building holds a rich and interesting history and was originally the family home of the Roman noble Marquis de Cinque. Elegantly restored, Villa Eva combines antique marble floors, Murano glass chandeliers and hand painted tiles with all of today’s required modern amenities. Wedding ceremonies can be conducted inside one of the stylish rooms or at a variety of panoramic locations within the huge park. 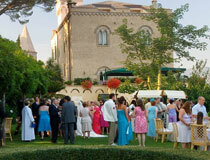 With the guarantee that your wedding will be the only event taking place on the day at Villa Eva, the overall package will also need to include your reception on-site (the cost will depend on which day you choose and number of guests) and suggestions will be made to you whether you fancy a barbecue, a pizza party, a buffet or anything else to suit your preferences and budget. Should you want your day to be totally private, exclusive use of the villa can be arranged at a supplement (this will be included if you have over 81 guests). 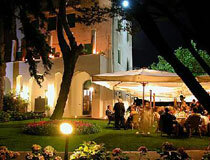 Well worth noting too is that Villa Eva is part of the Hotel Giordano’s complex where we can arrange accommodation for you. 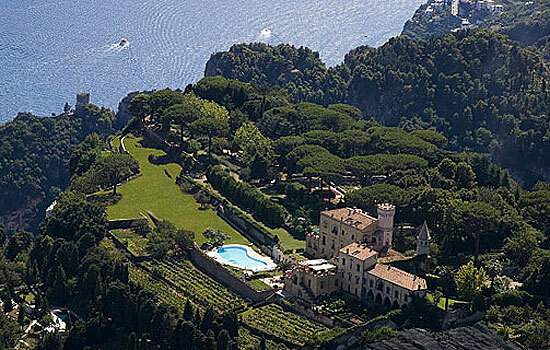 Nestled within a magnificent park that boasts the most amazing views of the famous Amalfi Coast, Villa Cimbrone also sits within 10 minutes walk from the centre of Ravello. Glorious gardens as well as stylish rooms offer couple a diverse choice of venues for their wedding day at this stunning 12th century villa. 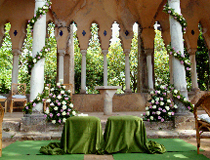 For your ceremony, the selection includes the gardens, the tea room, a private terrace for up to 50 persons, the Gothic open gallery… and even a small temple that suits 2-4 persons only. 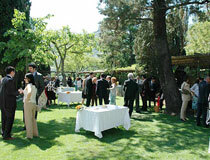 Venues for your reception are also plentiful and include various garden settings and terraces, the Gothic open gallery and Il Flauto di Pan restaurant. 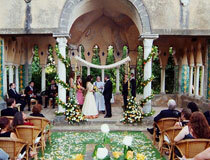 A whole range of extra services such as flowers, entertainment, etc. (even a body guard and helicopter service, should you so wish), can be provided too. 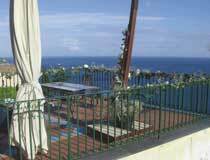 There are 19 rooms at Villa Cimbrone where you and your guests can stay and a further choice of accommodation is also available nearby. Exclusive use of the villa is available at a supplement if you have less than 30 guests or included for larger parties up to 140 persons. 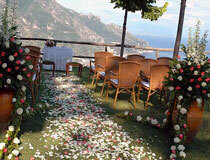 With its breathtaking location on the cliffs overlooking Positano and the Amalfi Coast, Hotel Le Agavi is a top class venue for your wedding day (and honeymoon too!). 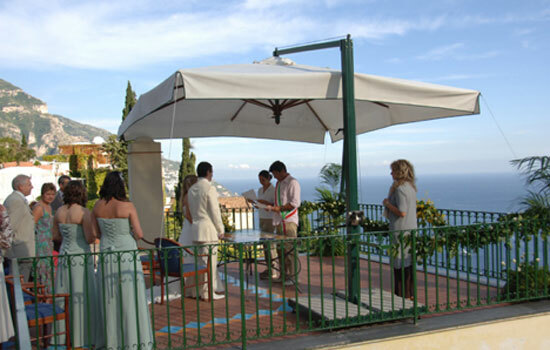 Now, just close your eyes, transport yourself onto one of the hotel’s many terraces and imagine taking your vows in this spectacular setting! ‘Yes, please’, we hear you say. 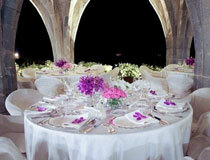 All will be arranged to the last detail, including your reception at the on-site restaurant. 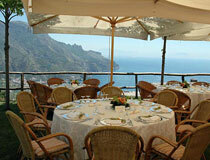 All rooms offer a balcony or a terrace, perfect to soak up the marvellous views. 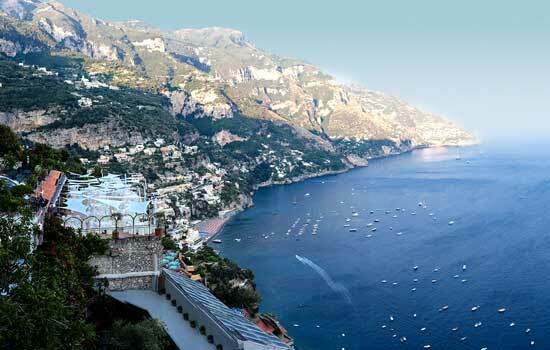 The hotel has a small pool, a beach club with a restaurant and its own funicular that runs along the cliffside. 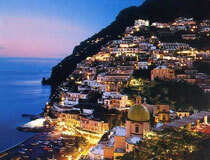 Located approximately 1hr 20minutes south of Naples, the resort town of Positano sits in the centre of the Amalfi Coast. Pastel coloured houses clinging to the side of the steep cliff that rises from the sea offer an inspiring and very picturesque view of this charming little town made famous in the 50’s by artists and writers who came to visit and settle in the area. 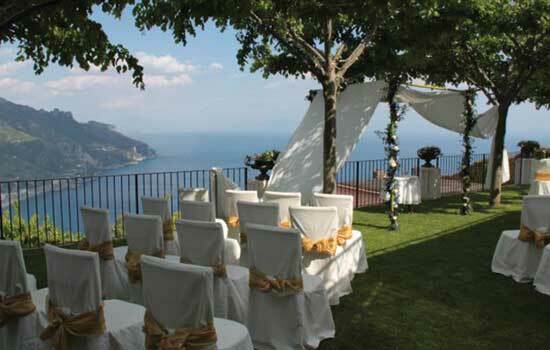 Our chosen wedding venue here is Positano Town Hall, where the terrace offers a gorgeous setting for ceremonies. 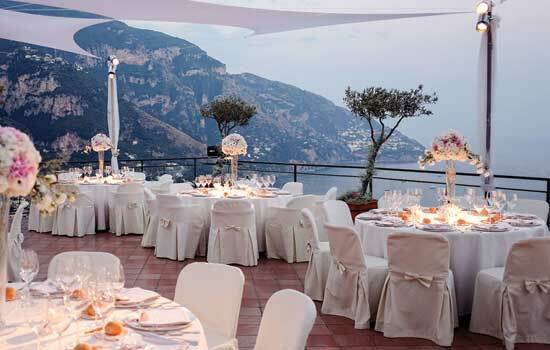 For your reception, we will provide you with details of a variety of restaurants available in Positano and we’ll also be able to recommend a suitable choice of accommodation within minutes walk from the Town Hall.